My students keep wanting to enter their entire research question into the search bar. I keep trying to tell them that’s a bad idea. How do you teach students to identify the right words to use in a search? Based on how Google ranks search results, typing in a question will be more likely to bring back pages with a question for a title. In many of our everyday searches this is an easy way to find question and answer sites when we want them, but Q&A sites are not necessarily authoritative sources for school work. So I have students write down their questions and teach them how to mark them up to create queries, the first step being to identify the significant words. Explaining how to distinguish the important words has sometimes proven challenging with younger students. Recently, however, fellow Googler AJ Kimbembe observed that the mark-up process reminded him of rebuses. You might remember these puzzles from childhood, where select words in a narrative are replaced with pictures. We started playing with the idea, and realized this could be a great lesson for students in identifying the best search terms. The searchable parts of this picture are [George Washington diary]. From an academic standpoint, the second result brought back highly authoritative sources that are specifically about diaries, rather than other books. The sources in the second search also appear relatively straightforward and clear, which is preferable for a younger researcher. Verbs and adjectives can also help in many cases. They may be harder to draw, but it strikes me that the challenge can be framed appropriately to help children think more critically about where to place their efforts. Consider this visualization a child drew for his question: What is the best wood for dogs to chew? This search did not get satisfactory results. Why? It appears that there is a general agreement among dog-lovers that there are healthier items for dogs to chew than wood, so he found no recommendations for a “best wood.” He could not have done any better with shorter searches, though, as dog wood gets results for the dogwood plant. A good rebus does not guarantee a successful resolution to a question, but neither does it preclude using verbs and adjectives. Trying to decide which little words to toss out becomes easier when you illustrate. There are other benefits of illustrating searches. For example, on the Search Education team, we often find that searchers get stuck with the phrasing in which a question first occurs to them. Working from images seems to free up the mind to look for synonyms. When the young boy illustrated his question about wood that is good for dogs, he drew a tree to represent wood. Looking at his drawing, the word stick also offered itself as a search term. 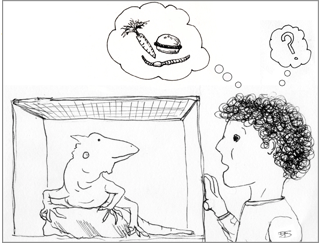 Similarly, librarian and cartoonist Diane T. Sands’ daughter wanted to know what lizards eat, which prompted her to sketch out the rebus at the top of this post. Even knowing her original question, looking at the rebus I searched for lizard food, rather than lizard eat, which brought back different results. As students graduate to more sophisticated questions, this method will not take them as far. But it makes a great teaching tool to get students off on the right foot...leading to teachers and students who are less frustrated. Try your own rebus and send me your favorite! Contact Tasha and check out the Search Education Team’s resources.